As my tastes have evolved from my college days of mac-n-cheese in a hotpot or late-night pizza, I have become more adventuresome in what I’m willing to try. I’ve eaten a lot of weird things — some I liked, some I didn’t — but I have had octopus a number of times and have always liked it. However, it’s usually a Date Night delicacy or something to try on vacation. I found I had a recipe for octopus in a cookbook by my favorite Spanish chef, José Andrés, so it was just a matter of finding an octopus for dinner. Despite Minnesota being the Land of 10,000 Lakes, I have yet to find one of these creatures in any of our lakes. One day I got lucky on a visit to Coastal Seafoods, which is THE place to get fresh seafood in the Twin Cities. When I saw they had frozen octopus, I just had to get one. Wouldn’t you?! Bring 4 quarts of water to a boil in a large pot. Add the salt, copper penny, bay leaf, and peppercorns. Grab the octopus by the head and dunk it three times in the boiling water, just up to its head (be careful not to scald yourself!). Then place the entire octopus in the water and lower the heat to a simmer. Cook uncovered for 1¼ hours. 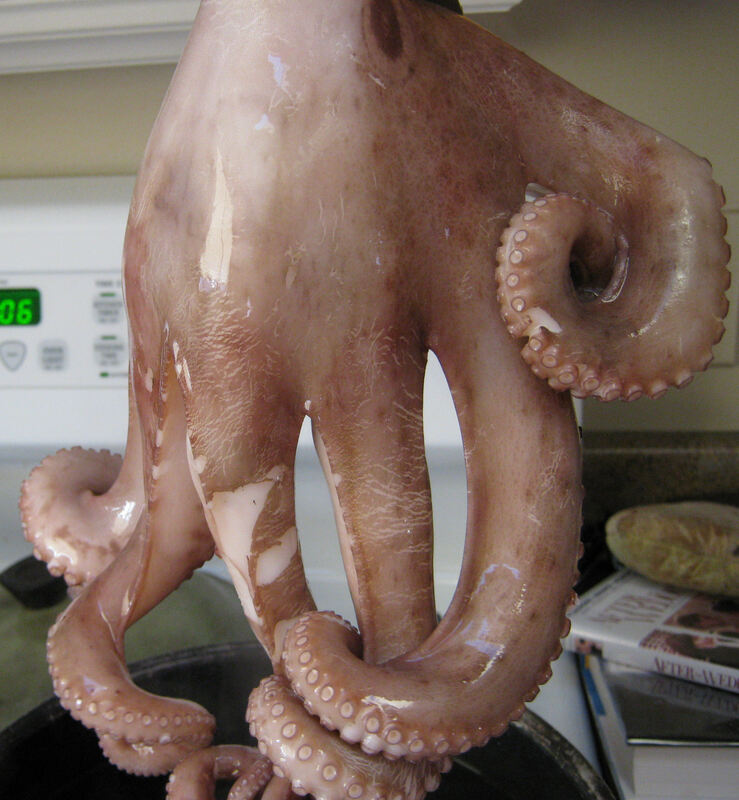 (Cook it longer if your octopus happens to be larger than 2 pounds). Add the peeled whole potatoes and cook another 15 minutes or until the octopus is tender. You can check for doneness by inserting a toothpick into the thickest part of the tentacle, just as you would with a cake. The toothpick should easily pierce the creature with little resistance. 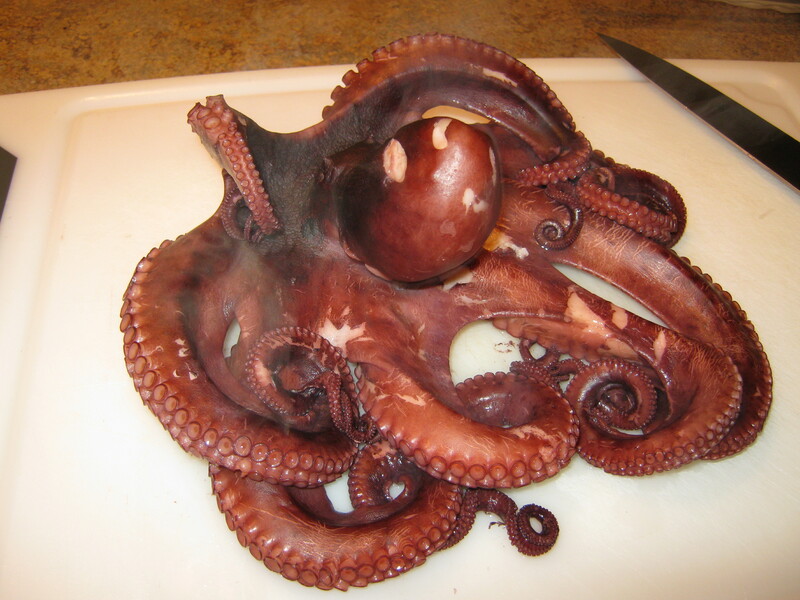 Use tongs to remove the octopus and potatoes from the pot, and set them aside. Cut the tentacles off the octopus and discard the head. Slice the tentacles into ½” pieces. Slice the potatoes and arrange them on a serving plate. 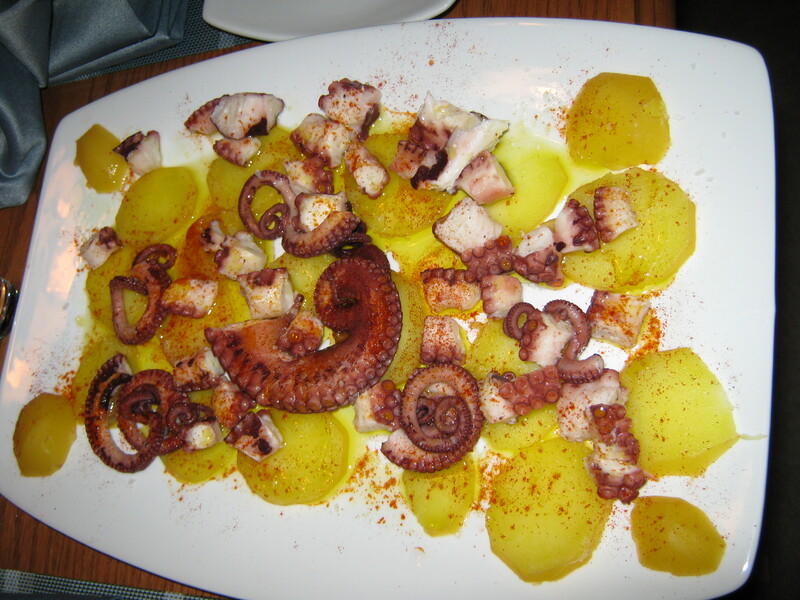 Place the sliced octopus on top of the potatoes; drizzle with olive oil and season liberally with sea salt. Place the pimentón in a fine-mesh sieve and, tapping the side of the sieve gently to break up any large chunks, dust it evenly over the top. Serve with either a chilled white Spanish wine (Albarino) or a hearty Spanish red wine (Tempranillo, Garnacha, Crianza). 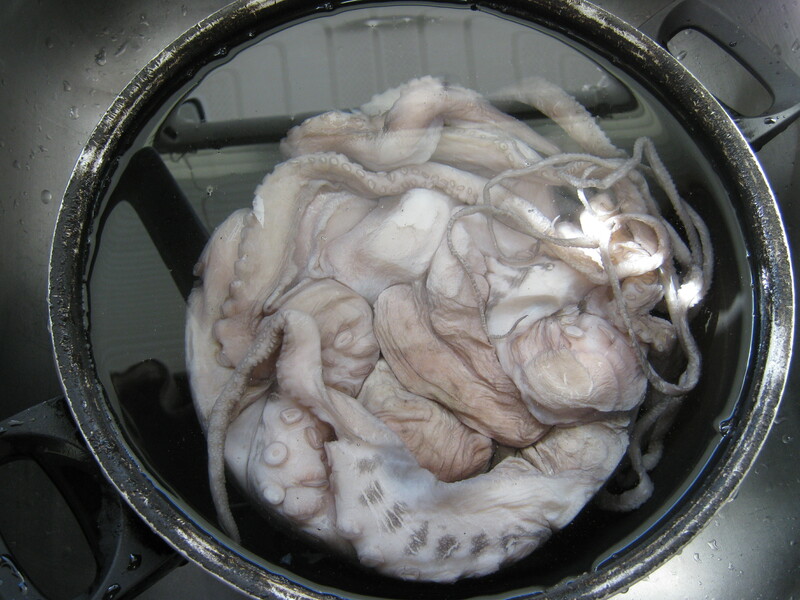 Unless you just happened to catch a fresh octopus somewhere, it will probably come frozen, so the first thing to do is thaw it in water for several hours. Step one of preparing an octopus for dinner is the Meet and Greet. This works best once the octopus is thawed. Get your water boiling with its added ingredients. Don’t forget the penny! I’ll tell you why, later. When the water is boiling, get ready for the dunking. Each dunk will shrink the tentacles and make them curl up. It was really amazing to me how quickly my 5-pound, 3-foot long octopus shrank down and curled up enough to fit in my pot after just three dunks. 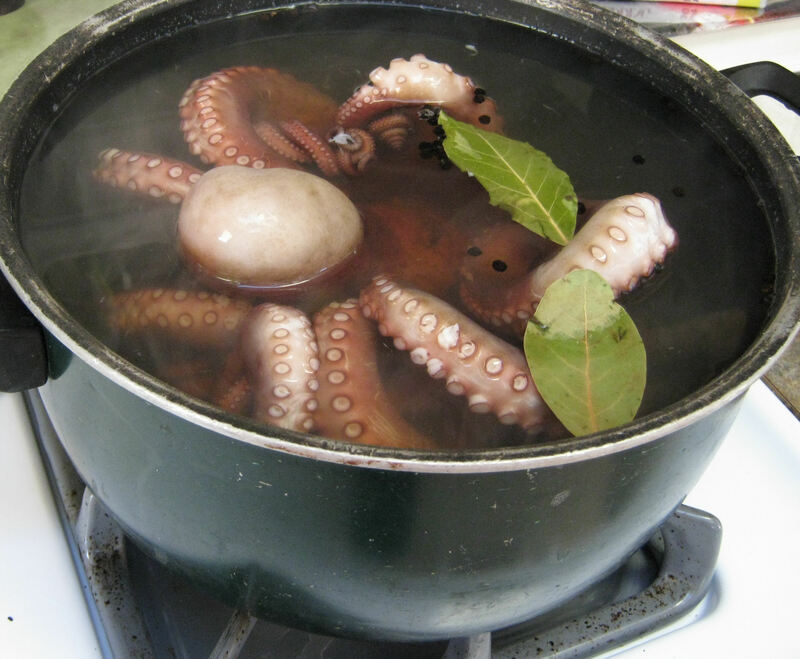 Place the entire octopus in the water and lower the heat to a simmer. Cook uncovered for 1¼ hours. 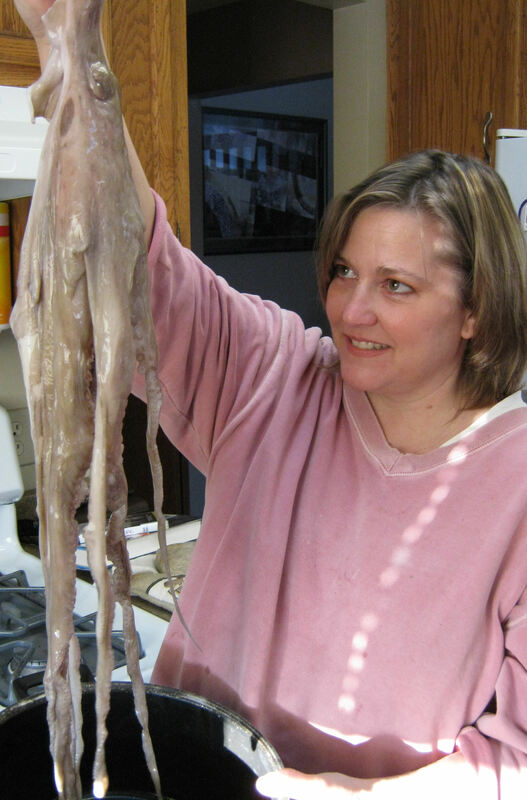 (Cook it longer if your octopus happens to be larger than 2 pounds, like mine was). 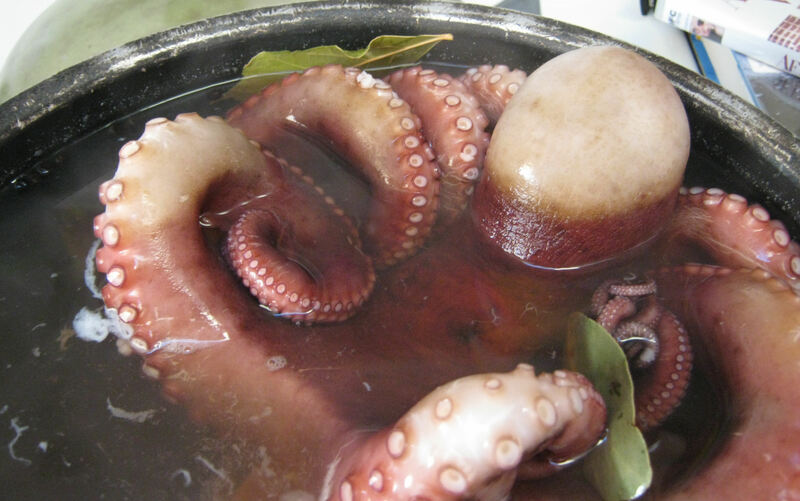 The Spanish cook these in big copper cauldrons, where the copper adds a red color to the octopus. Assuming you don’t have a copper cauldron, you can get the same effect by using a penny. Really. Just one penny is all you need. You can see in this photo that the submerged parts have a red tinge, while the parts that didn’t come in contact with the water (or, therefore, the penny) are still white. 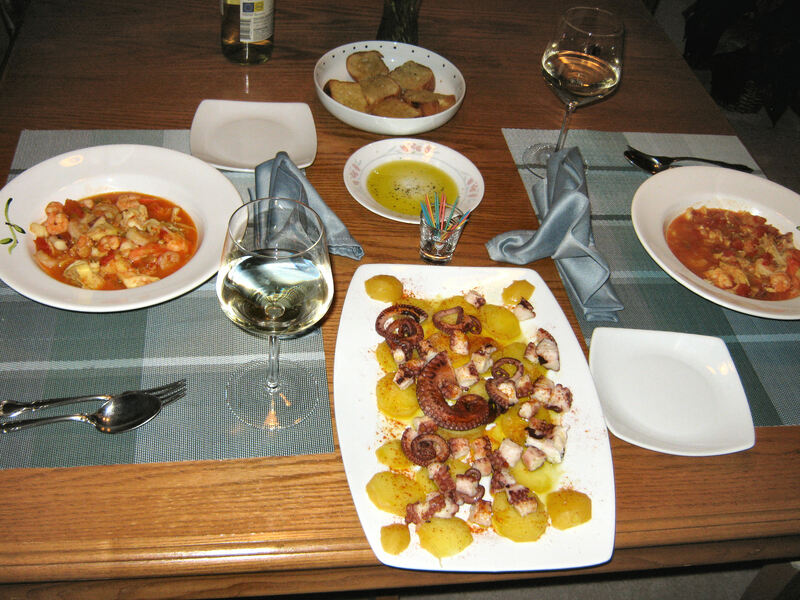 Add the potatoes and cook until the octopus is done, which you can test with a toothpick or skewer. When it glides in easily, the octopus is done. Remove the potatoes and set aside. Place the octopus on a cutting board. Slice the tentacles and potatoes as directed, and serve. I served mine as a starter/side with a seafood stew. Maybe I didn’t think a 5-pound octopus would be enough to feed two people, or maybe I wasn’t sure it would turn out at all, and wanted a backup plan. Serve with the Spanish wine of your choice. Enjoy!